Buying a new front door is a lot like buying a new car. First, you need functionality and safety; then, if you can afford it, you can load it up with extras. Whether you’re cruising to replace an old door that has warped with age or are building a new home (lucky you!) and want to find something that will pass the test of time, you need to consider your options—and in today’s marketplace, there is certainly no shortage. You can zoom through a range of styles to complement your exterior and give your family the added security it needs. Choices range from custom hewn solid wood doors to easier-to-maintain steel doors to fiberglass composites that meet somewhere in the middle of the price list. You are certain to find the perfect match. Solid wood doors are the highest-end alternative: think Mercedes Benz. Customized style is definitely the grabber, with a price tag to prove it. 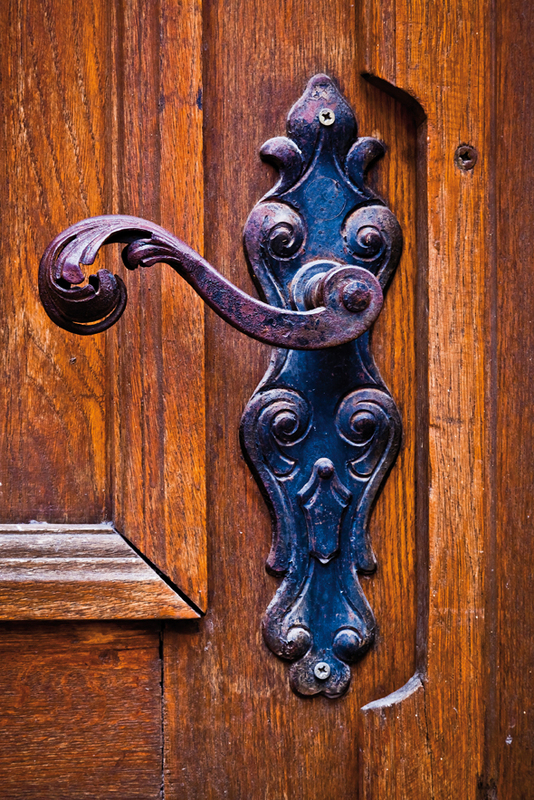 Unlike steel and fiberglass that are mostly stamped or cut from a mold, a wood door with ornate carvings and variety of rich stains offers the most custom options, the feature that certainly drives the cost. Some homeowners simply cannot resist the all-natural real deal. Coming in oak, cherry, walnut, mahogany, maple, fir and pine, most stock wood doors are actually wood veneers with a specially-designed hardwood core. The veneer will bend and expand, while the core resists any warping. For a door that uniquely reflects the style of your home – whether Victorian, antique, or old country – a solid wood door is the top choice. 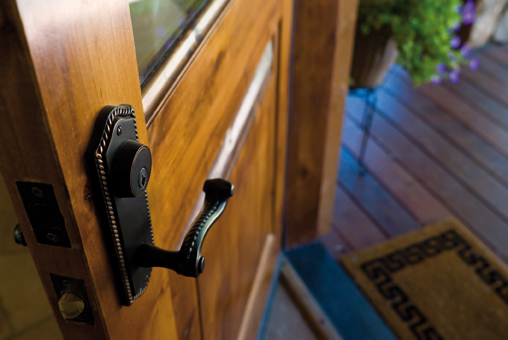 Consumer Reports shows today’s solid wood doors are best at resisting wear and tear. They’re the least likely to dent, and scratches are easy to repair. They will need regular repainting and varnishing to keep their shine, though. If you decide on a prefinished wood door, make sure you pick one with a durable stain and a clear finish, such as polyurethane. If you’re choosing to paint the door, choose a high-gloss sheen to provide the best protection. The door will need a fresh coat every couple of years. According to Consumer Reports, steel doors account for about half the market. No doubt called upon for their durability and security, steel doors are also relatively inexpensive. What they might lack in character, they make up for in energy efficiency with a core of foam insulation. They resist warping, swelling and splitting like their wood counterparts, but they, too, need regular maintenance. Sometimes the surface will peel and, when neglected, can cause rusting. humid climates, fiberglass can meet its match. The material lasts longer than wood or steel. It can also help save you money on your heating and cooling bill. According to the U.S. Department of Energy, a 1-1/2 inch thick steel or fiberglass-clad entry door without a window has more than five times the insulating value of a solid wood door of the same size. Once you’ve chosen which type of door will work best, you will need to make choices on installation, size, color and hardware. Most new doors are “prehung,” meaning that they hang on hinges within a new frame (weather-stripping is usually included). These systems are the best choice if the old frame is bad or if you’re removing the frame because you want to enlarge the opening. There are some door systems which include a steel frame that simply attaches to the old one. Though easily installed, these systems can reduce the size of the original opening and cannot be installed where there are rotted jambs. If you have the flexibility of choosing the size of the opening, that greatly increases your options for style. French double doors make a truly grand entrance. Or perhaps you’d like to add a sidelight (glass inserts that run the length of the door) or a transom (overhead glass inserts usually in the shape of a rectangle or an arch). Any added glass artwork will raise the cost of course, as well as the energy needs, but it is a great way to create curb appeal. The use of ironwork on top of the glass is also becoming fashionable again. Though a simple task, one thing you can’t forget is whether your home requires a left- or right-hand door. It makes difference! While you can purchase your new door from your local home center or lumberyard, you will find more options online at manufacturers’ websites. Some major manufacturers include Masonite, Therma-Tru, Pella, Andersen, Formosa and Jeld-Wen. 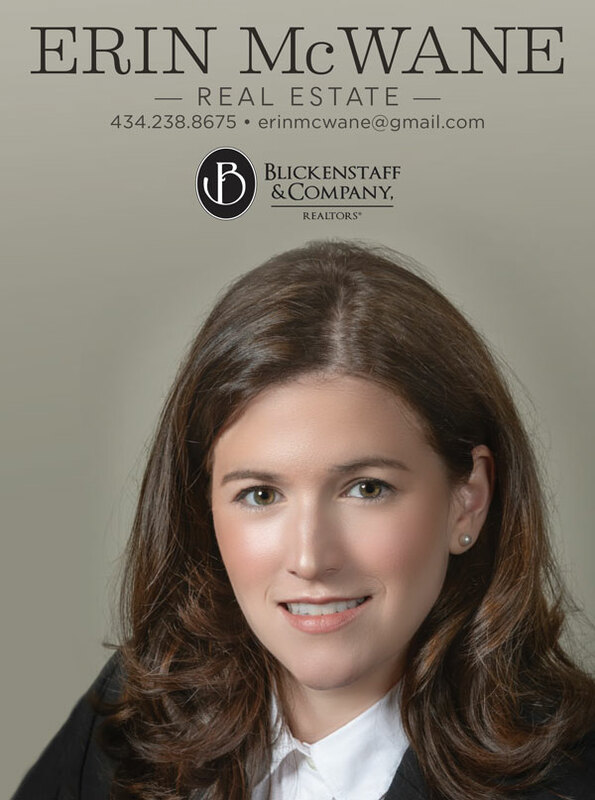 Call the manufacturer for information on authorized dealers in the area. Some manufacturers offer more custom options than one might think. If you have a particular preference in mind and prefer to work with someone face to face to create a one-of-a-kind design, call on a local woodworker or millwork shop. Stop or go on storm doors? A quick browsing on the Internet for the trendiest in door designs will bring up many beautiful pictures, but usually the storm door is missing. Is this a good or bad thing? There seems to be a debate on using a storm door or screen door at your front entrance. Though many enjoy having this option during the few short months of the year when we want to leave the door open for a fresh breeze without inviting in insects, others think it deters from the overall aesthetic value. And while it does add more protection for your door from weather, in some cases it can actually cause damage. Glass storm doors definitely aren’t recommended for exterior doors that receive more than a few hours of direct sunlight each day; the glass traps heat against the entry door and can damage the finish. Storm doors do come in more styles than ever before, including “full view”—one big pane of glass that can show off your new door, often including ornate etched designs or sleek lines that can add style to an already existing or repainted plain door. Mid-view storm doors remain popular, with most featuring a 2-inch line dividing the top and bottom panes. These doors cost significantly less than full-view versions, but still come in as many options. Storm doors once came with permanent screens but today’s doors have retractable screens that can be tucked out of sight if need be. The newer models also have improved lock and release mechanisms so that, with the tap of your foot, the door will stay open when you’re running back and forth carrying groceries. One thing that can’t be debated about storm doors is the added layer of protection for your home and those within. Storm doors should have deadbolts, too, and intruders are deterred by the time it will take to break through not one, but two, doors. Never before have there been more options for front door embellishments, the bells and whistles that turn your door into your own. 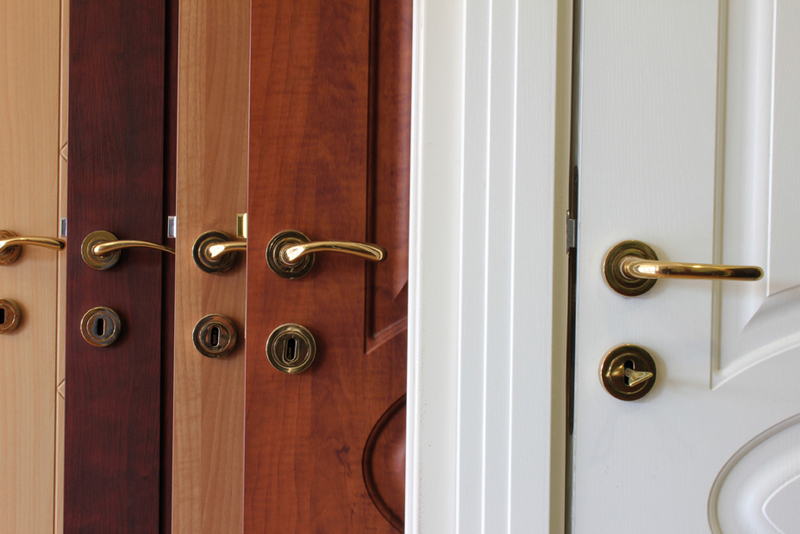 From locksets to knobs to knockers and doorbell surrounds, styles come in bronze, brass, pewter and nickel varieties. Have fun shopping for the various whimsical accessories. A quick search of Pottery Barn online, for example, shows knockers and knobs in equestrian, nautical and botanical themes. If you search hard enough, you can find that item that reflects a special interest of your family. You must first check to make sure the door you chose does not recommend certain hardware manufactured specifically for that door. Even then, the manufacturer may have more options than you would think. It’s an unsaid trend in the design world that if you want your front door to stand out, paint it a bold color and reserve it especially for that part of your home. Some doors can be ordered pre-finished in a variety of colors or stains, but of course, such preparation will cost more. The popular steel door sold in home stores, with or without windows, comes already primed and is often the lowestcost option. Or, you can save additional money by doing it all yourself with a few of coats of primer and paint. 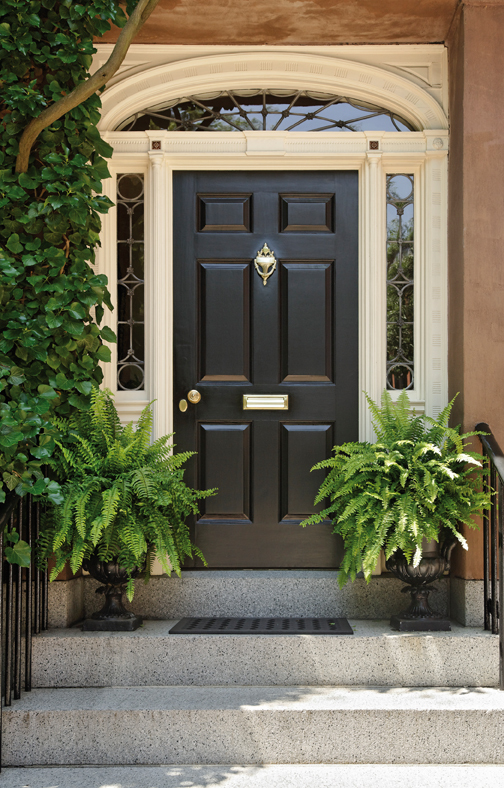 It has been said you never get a second chance to make a first impression, and that’s also true for your front door. Whether it greets guests at your dinner party or a pizza delivery the day after, a proper entry door can serve you well in style and function.